When we lived in California, Las Vegas was just a few hours away. It wasn’t unheard of for us to wake up on a Saturday morning and just head out for an impromptu weekend at the tables on the Vegas strip. While I could usually be found tossing dice at a low-limit craps table, Nicole’s favorite was to test her skills at ’21’, otherwise known as Blackjack. Because in Blackjack, once you ‘go over’, that’s it – you’re out of that hand. It’s too bad there isn’t a prize for second place, I’m sure she would have excelled at that. 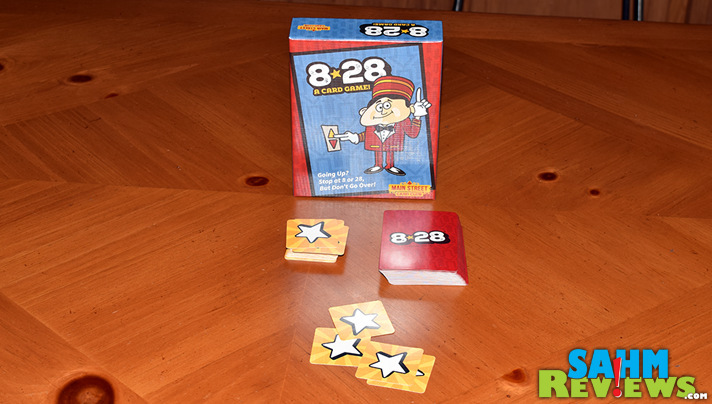 Recently a friend introduced us to a brand new card game called 8-28 by Main Street Card Club. 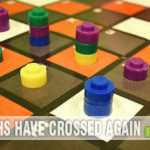 It promised to reward those who would ‘bust’ on their first attempt and not require a bid to play! 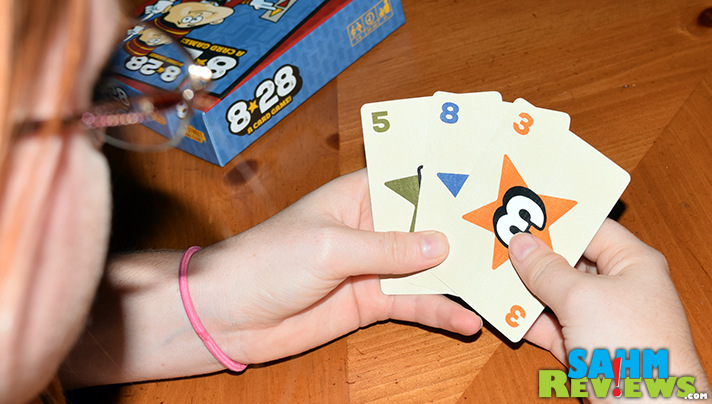 Supporting up to six players, 8-28 is a press-your-luck card game that challenges you to collect a sum total of cards that equal either 8 or 28, also without going over. The conveniently-sized box contains a custom deck of 52 cards, 40 scoring cards and a card tray. At the beginning of a round the dealer antes two of the scoring chips to the center and deals one card to each player face-down. They may pick it up and hold it in their hand, but are not allowed to show it to anyone else. 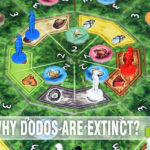 The dealer then offers each player (in turn order) the option of taking an additional card. Unlike Blackjack, you may pass at any time and this doesn’t mean you are done for the round. Situations change and you may wish to take a card at a later time. 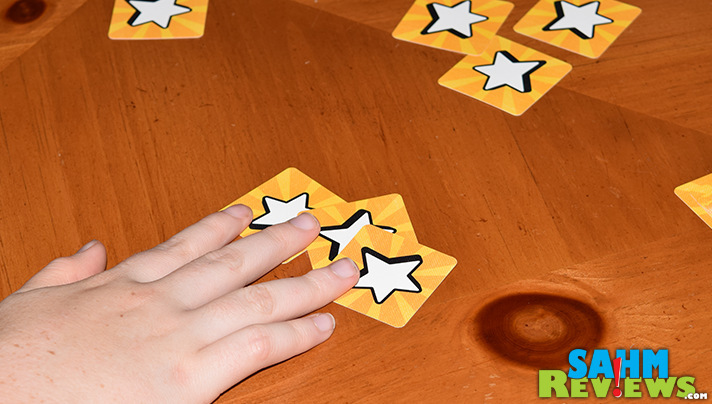 After each player has had the option of taking a card, the entire deck is passed from the dealer to the person on their left, who becomes the new dealer. 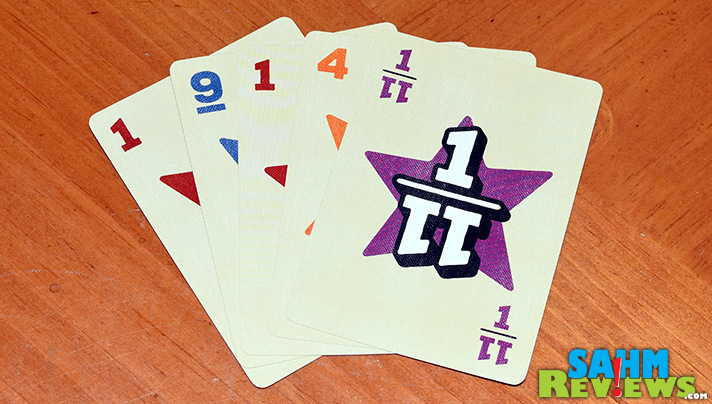 They add an additional scoring chip to the pot and also offers one card to each player. If a player goes over 28, they are ‘busted’ and cannot win any chips this round. BUT, they do not have to reveal they have gone over – they can continue to play to try to bluff other players into also taking more cards and hopefully also busting. 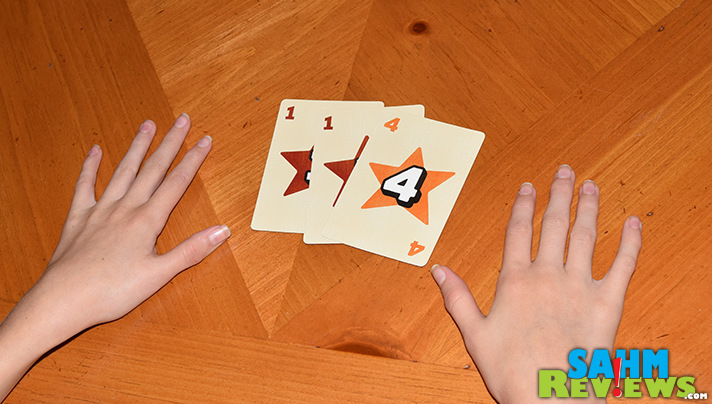 Once all players pass in the same round, the round is over and everyone reveals their cards. The scoring pile is divided into half with any odd chips being set aside for the next round’s pot. The player with a total closest to 8 (without going over) is awarded one half, and the person with a total closest to 28 (again, without going over) claims the other half. Note, if all players are over 8, those chips are saved for the next round. If all are under 8, then the closest player wins BOTH pots as they are closest to 8 and 28! New rounds are played until all 40 scoring chips are used. The person who collected the most scoring chips is declared the winner! 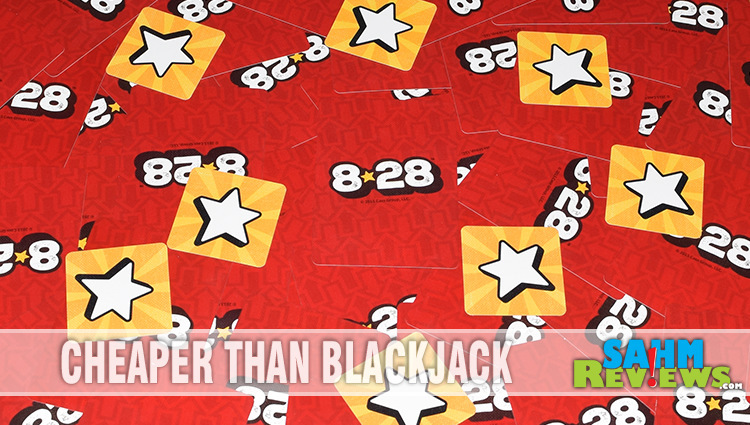 So unlike Blackjack, in 8-28 if you bust trying to get close to 8, you still have the opportunity to try for a second total of 28! Recommended for ages 8 and up, you can expect a full game to take around 30 minutes or so. We’ve found that to be the perfect time length for any family gathering. Get a copy of 8-28 on Amazon for around $13 or from your local Toys R Us. 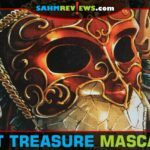 Check out the other fine titles that Main Street Card Club currently has available for purchase and be sure to watch their Facebook timeline for new product announcements! What is your favorite game to play in Las Vegas? Not sure I have seen this game before. I will have to ask my son. Yes, I like to press my luck. My family loves to play card games. This definitely looks like one my family would enjoy playing on family night! 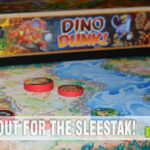 I enjoy Press Your Luck games, though it is not my favorite mechanic. Card games are so much fun. I don’t think I’ve ever seen this one before though. I love playing card games. I’ve never seen this one before, but it looks like a lot of fun. Thanks for sharing another gem! See, that looks like pure fun! I love that it will take 30 mins. so even the attention-depraved can get through a whole game without struggling! This sounds like a great game. My daughter used to love to play games, but she had a SUPER short attention span. A 30 minute game like this would have been perfect. Have never seen this game before but I’m always up for playing. Yes I like them in moderation. Yes, I do enjoy pressing my luck when playing games. I like to take a chance!